What a difference a renovation can make. 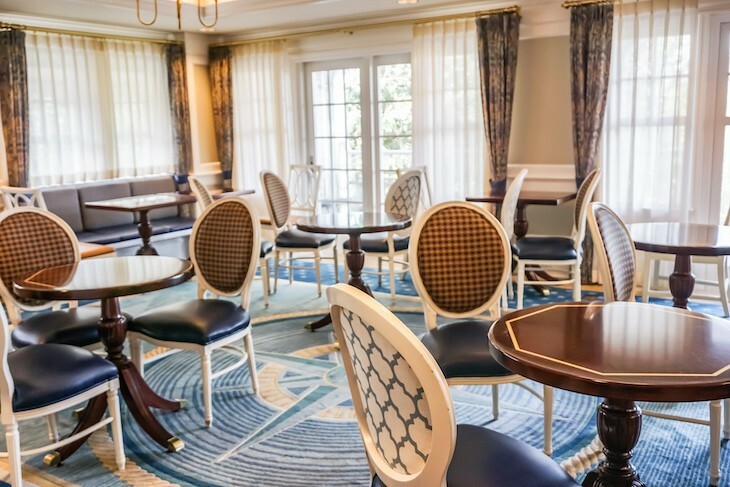 Disney's Yacht Club has gone to old-style yacht club atmosphere to one of a gorgeous nautical chic. 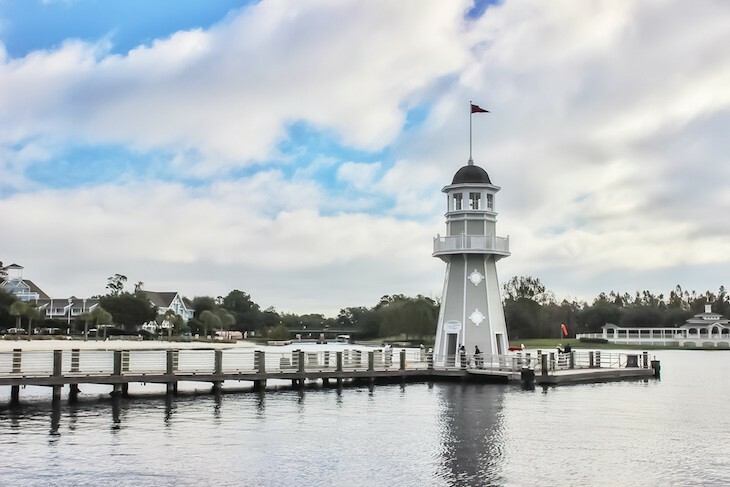 Four- and five-story oyster gray shingle-style buildings with balconies shaded by red and white striped awnings front Crescent Lake and a sliver of groomed beach that stretches over to the adjoining Disney's Beach Club Resort. 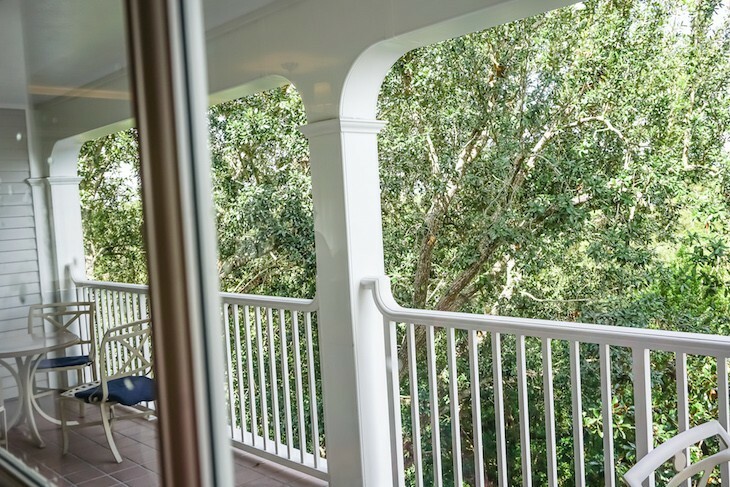 This near-perfect location is within walking distance of Epcot®’s International Gateway entrance as well as Disney's BoardWalk and just a short boat ride away from Disney’s Hollywood Studios®. 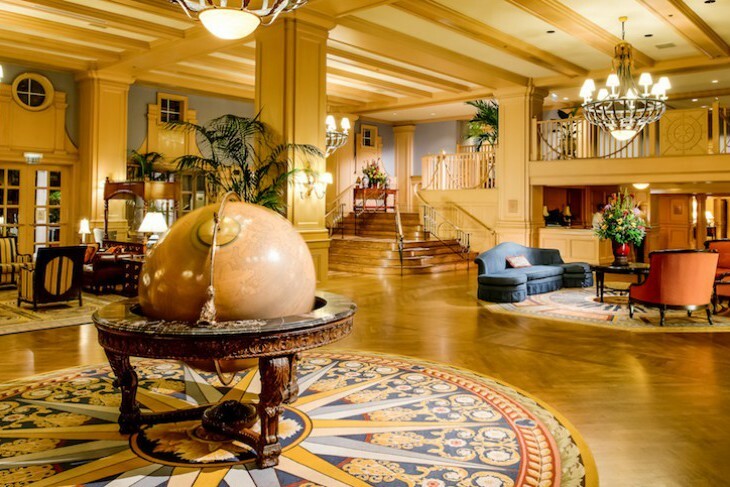 The polished, sleek lobby of ship-shiny dark oak hardwoods, potted palms, roped nautical railings, leather sofas, and overstuffed, striped easy chairs creates an environment reminiscent of an eastern seaboard hotel of the 1880s. The antique globe in the center of the room along with detailed ship models and oceans of gleaming brass complete the picture. 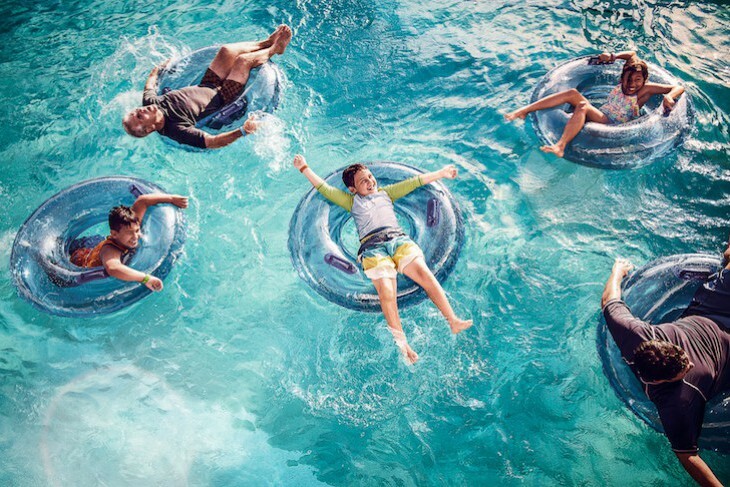 The resort shares Stormalong Bay, Disney’s fantasyland of a pool complex, and all recreational areas and facilities with its sister property, Disney's Beach Club Resort. 621 rooms. 1700 Epcot Resorts Boulevard, Lake Buena Vista 32830; phone (407) 934-7000, fax (407) 934-3450. Check-in 3 p.m.; Check-out 11 a.m. 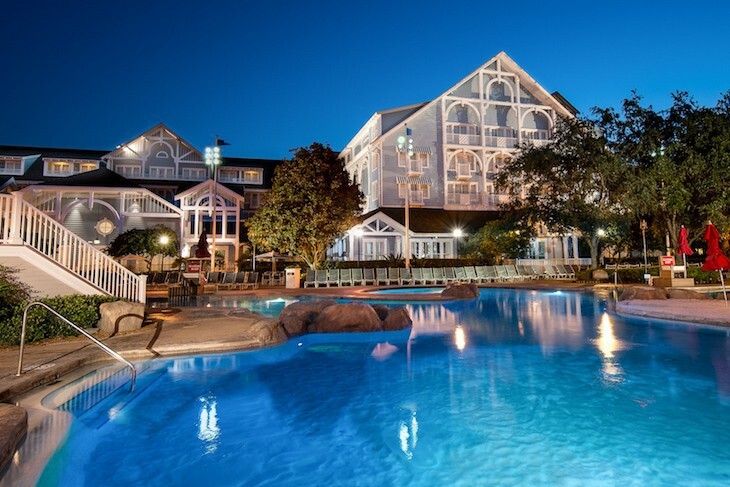 Shared with the next-door Beach Club, this is Disney's best pool. Pick up the boat to Epcot and Disney's Hollywood Studios on the lighthouse pier. 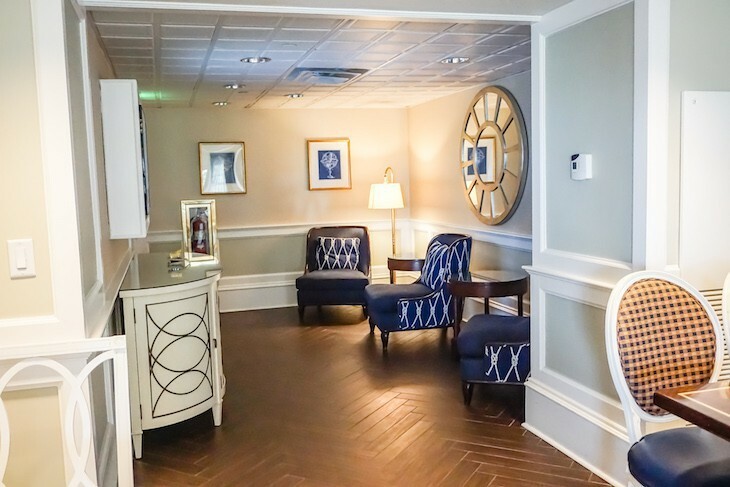 At 2,374 square feet this is the Yacht Club's largest suite. 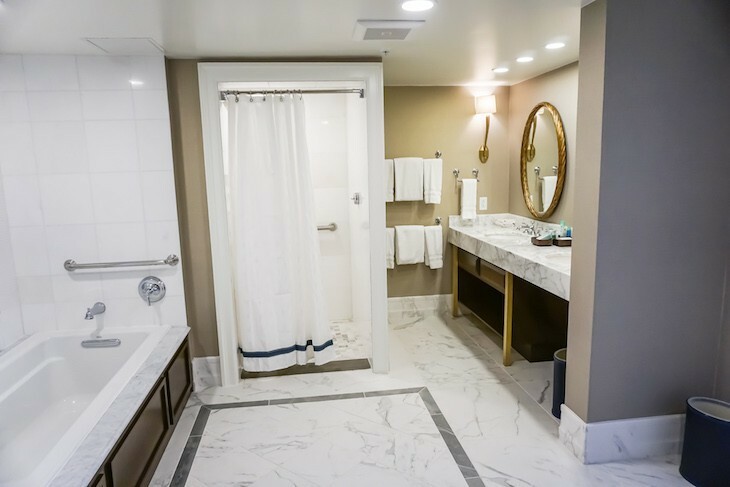 Renovated guest rooms offer a more contemporary look with a luxury cruise ship cabin look. 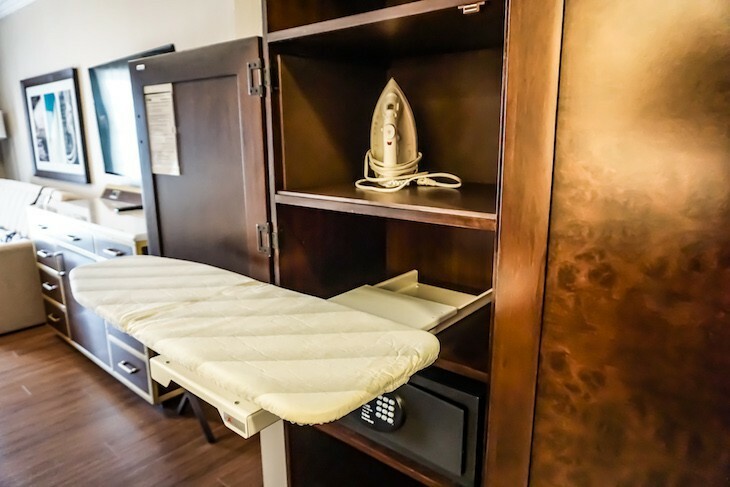 Rooms are fairly spacious at 400 square feet with either two queen-size beds or one king, with room under each to store luggage. Rich wood borders the cloth-covered blue and white headboards that accent beds made up in white sheeting. 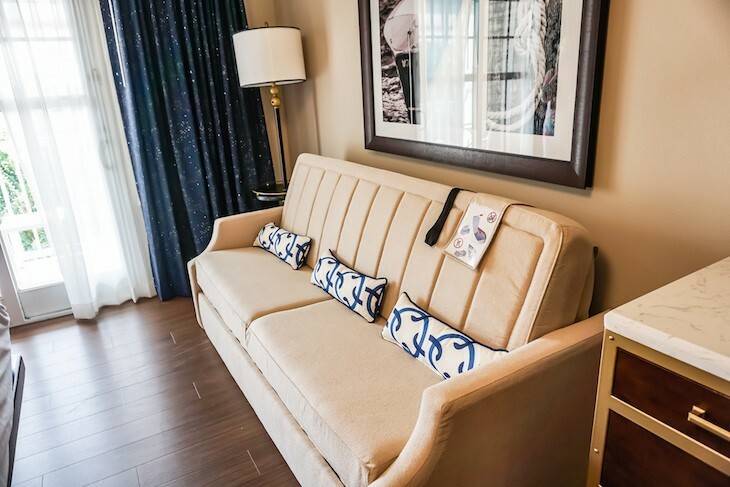 Most rooms come with a chenille cream-colored flip-over sleeper sofa sporting brass nailhead accents. 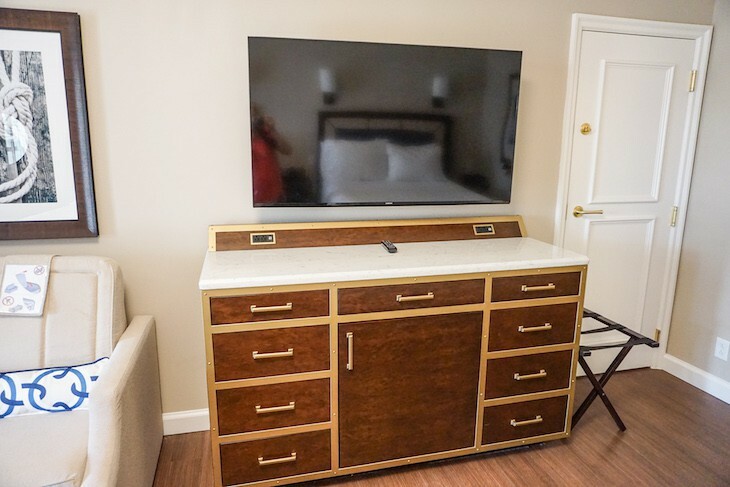 Other furnishings include a wood and granite desk, porthole-style mirror, and a nautical-style bureau with a large wall-mounted flat-screen TV above. 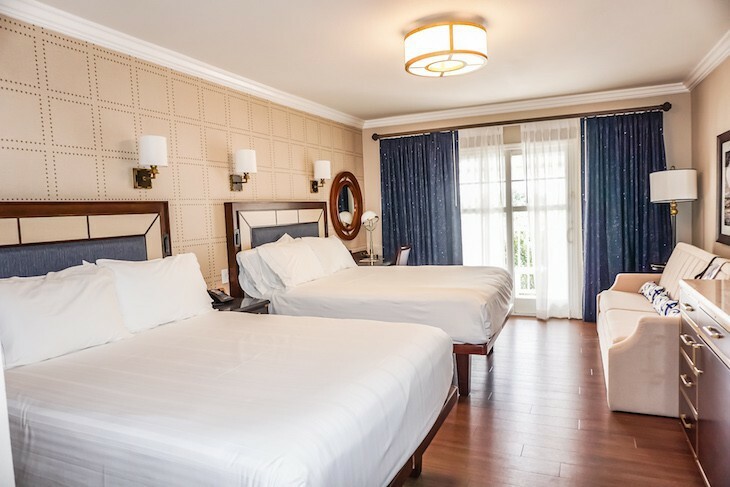 And for the first time in a standard room at a Deluxe Disney resort are wood floors throughout in lieu of carpeting. 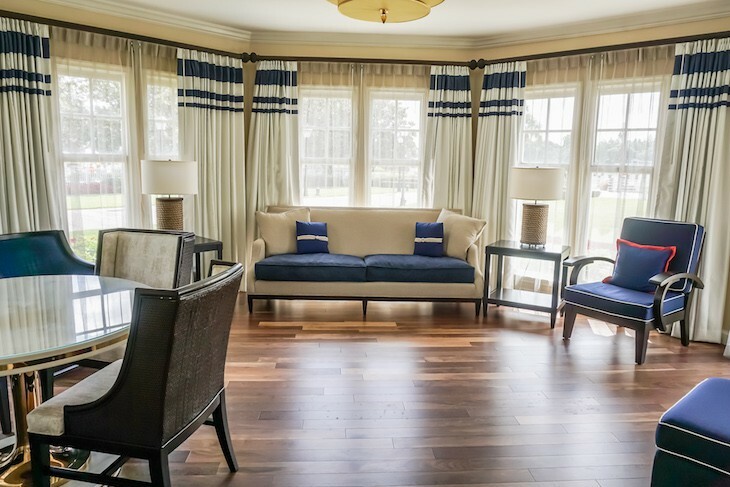 The doors leading to the patio or balcony are covered in Disney-inspired constellation themed navy curtains. By the bath is a spacious, internally lit closet area with a neat fold-down ironing board. 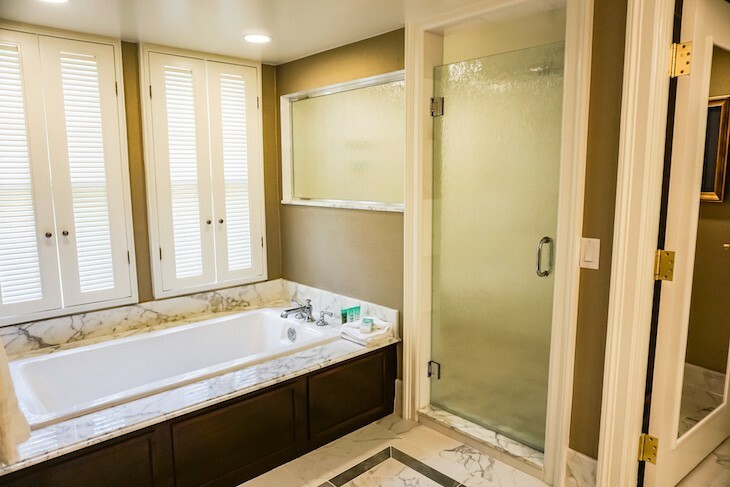 The quartz bath vanity area can now shut off from the bedroom via sliding pocket doors. 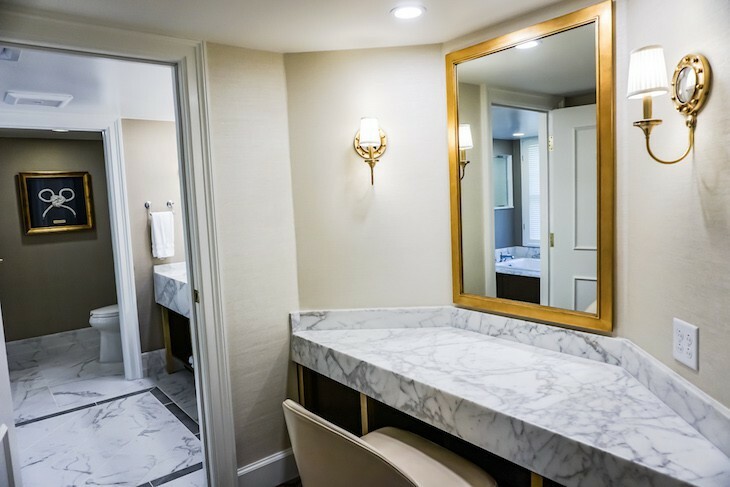 The bath holds double sinks in a dark wood vanity, hair dryer, lighted makeup mirror, H2O+ Sea Marine bath products, and, most exciting of all, great lighting. 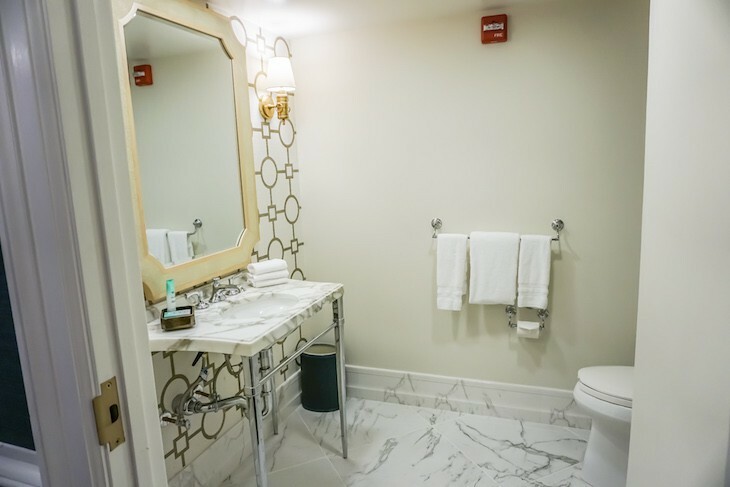 There is a separate tub and shower area with a frosted door; some rooms come with a bathtub but are on request only so families with young children should take note. 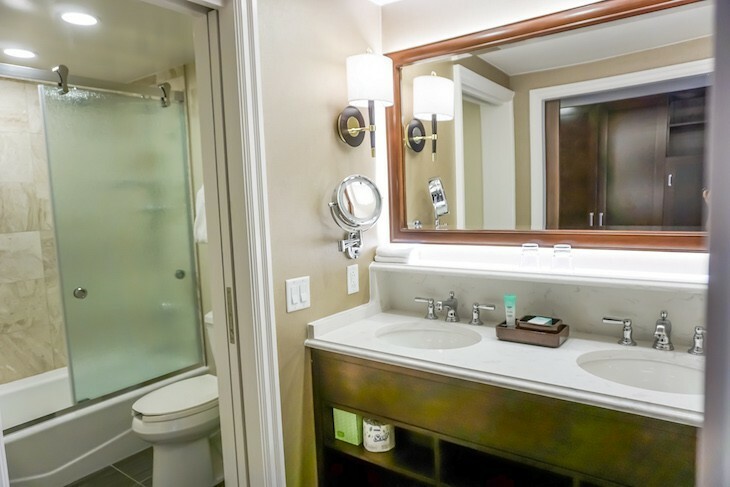 Amenities include a Keurig coffeemaker, small glass door refrigerator, and electronic safe. 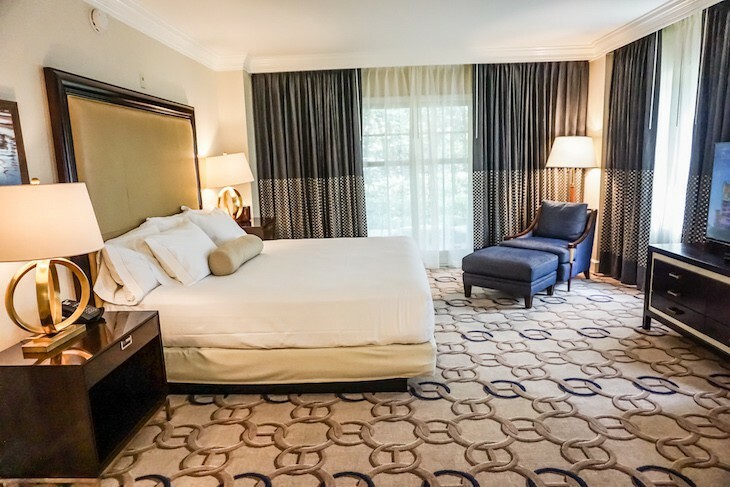 Cara's Tip: Standard View rooms come with a view of a slice of the parking lot or the rooftops so be sure to book a Garden View requesting one near the quiet pool that look out on the grassy area with a fountain and duck pond. Lagoon/Pool View rooms face Crescent Lake, Stormalong Bay, or sometimes both; ask for one facing Epcot for a distant view of the Illuminations fireworks. If too much walking is not your idea of a vacation request a room close to the lobby; the resort is quite spread out, and long treks to your room are not uncommon. King-bedded rooms can also come with a sofa sleeper so a family of four might get this type of accommodations. 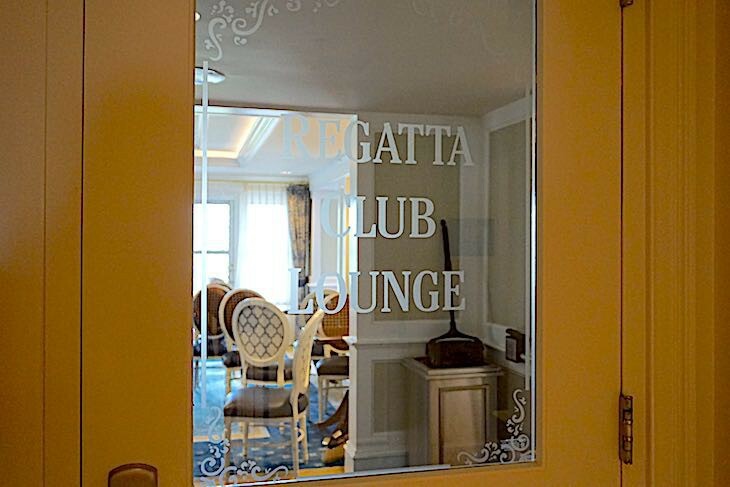 Most are located on the fifth floor and privileged to the expanded Regatta Club, one of only a few Disney concierge lounges with a full-size balcony but alas with a view of the front of the resort instead of Crescent Lake. A much calmer atmosphere prevails here as compared to the Beach Club’s lounge next door so if it’s peace and quite you are looking for choose this resort over its sister property. 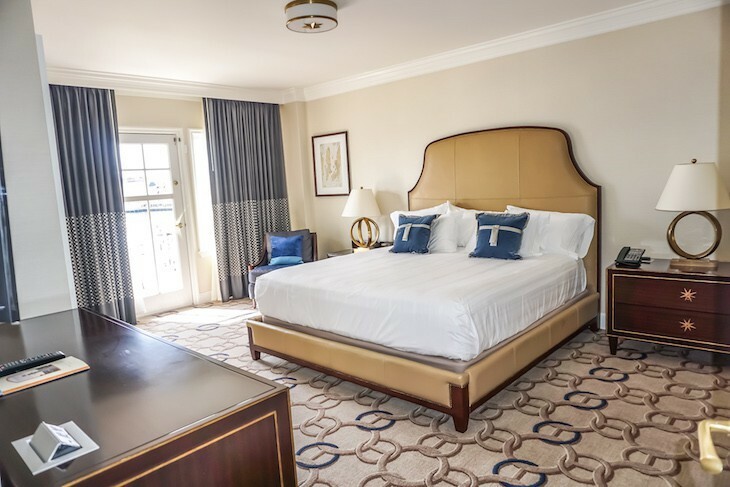 Most concierge rooms are standard; for extra space choose the 654-square-foot Deluxe Rooms, all located on the third and fourth floors, and all with two queen-size beds, a small parlor separated by a partial privacy wall, and views of Crescent Lake. They do, however, require an elevator ride to the concierge lounge. 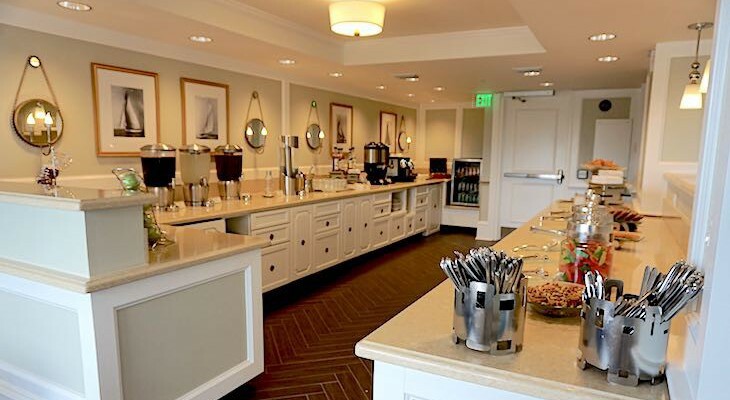 In the lounge mornings begin with coffee from a self-service cappuccino machine, juice, coffeecake, muffins, croissants, bagels, cinnamon rolls, banana bread, pastries, oatmeal, yogurt, hard-boiled eggs, fruit, and cereal. Midday snacks consist of salted potato chips with garlic peppercorn ranch dip, Swedish fish, fresh fruit, milk chocolate-covered pretzels, hot and spicy trail mix, nut mix, multi grain bread, crackers, lavish and breadsticks with red pepper hummus, cookies, lemonade, iced tea, and Stormalong Bay Breeze concoction. Early evening brings wine (Penfold’s Rawson’s Retreat Merlot, Beringer White Zinfandel, Mirassou Pinot Noir, and Columbia Crest Chardonnay), beer, and hors d’oeuvres such as hummus, crudités, Artisan cheese and crackers, potato salad, orzo pasta salad, broccoli slaw, mozzarella and tomato salad, lobster salad, and Israeli couscous salad along with a hot item like potato and pea samosas with mango chutney, ginger pork potstickers, vegetable spring rolls with sweet chili sauce, conch fritters, red pepper and goat cheese in phyllo, crab rangoon, grilled chicken skewers with yogurt cucumber sauce, bacon-wrapped scallops with mustard dipping sauce, and spanakopita. Kids feast on peanut butter and jelly with rolls and apple slices with caramel dipping sauce. After dinner is a selection of cordials and desserts such as raspberry or chocolate/peanut butter mousse, chocolate teacake, brownies, caramelized cheesecake, mini cupcakes, and Oreo bonbons. 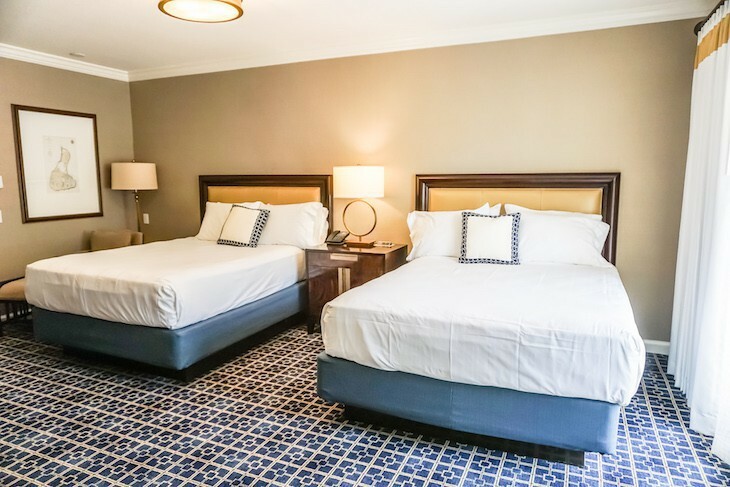 Extra amenities include guest robes, turndown service, private check-in and checkout, and the services of a pleasant and service-oriented concierge staff. 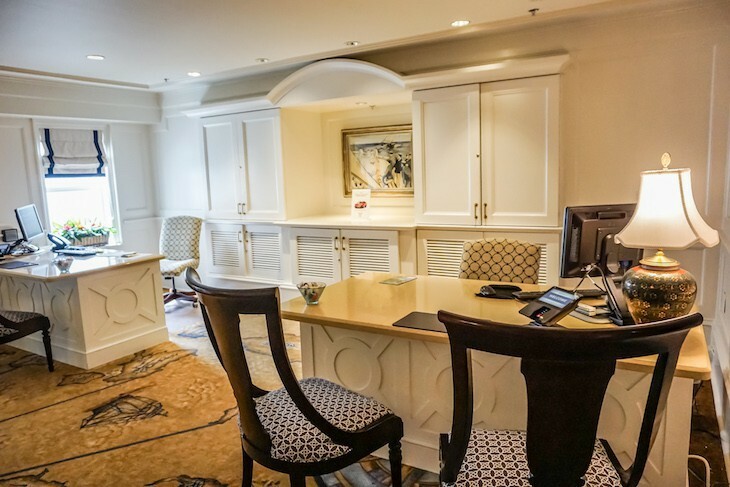 A variety of suites are available, all with concierge lounge access. 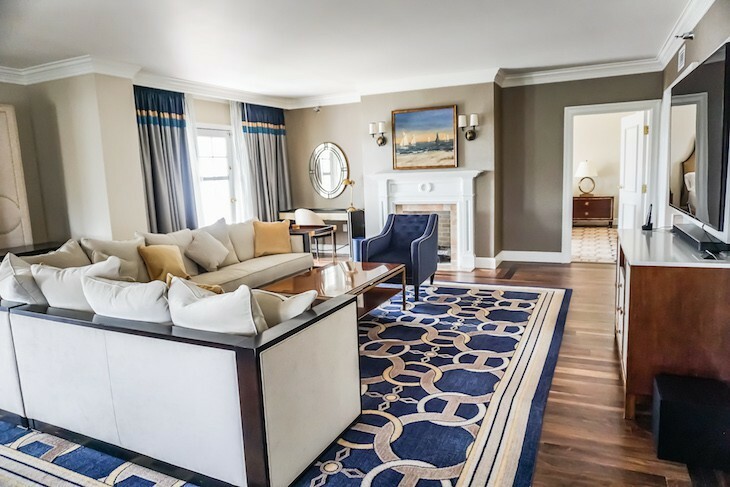 Three Turret Two-Bedroom Suites, located on a corner on floors one, two and three, offer 1,160 renovated and redesigned square feet with lots of navy and cream colors, hardwood flooring, and plenty of charm. Off the left of the entry hall is a standard size guest room with two queen beds but with upgraded décor, bath, and patio or balcony. Then on the opposite side of foyer you’ll find an alcove with desk and another full bath with shower/tub and single sink. Next up is one of two living areas with sleeper sofa, coffee table, easy chair, 2 desk, credenza with TV, and wet bar; followed by a 2nd living area in the bright and sunny turret, beautifully decorated with hardwood flooring, fun navy and cream décor, 4-person table, sofa, and retro-yacht chairs. 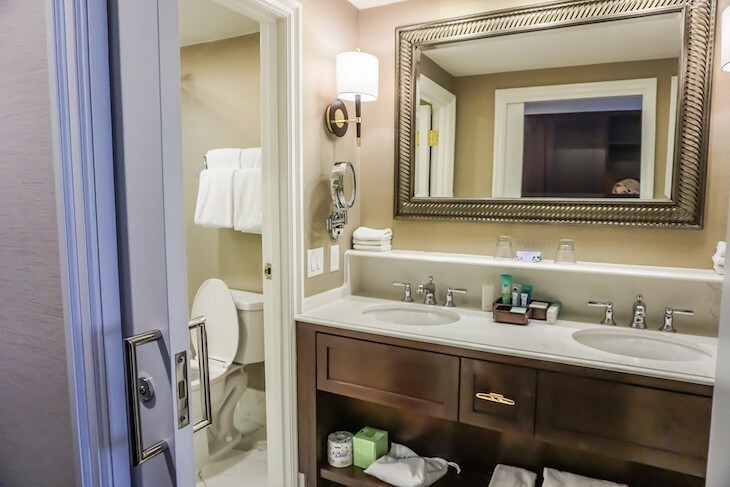 The master has a king bed, easy chair and ottoman, bureau, and TV with a standard-type bath with tub/shower combo. A patio or balcony can be accessed off the master as well as the turreted living area. Views are of the walkway leading to the Boardwalk as well as Crescent Lake. 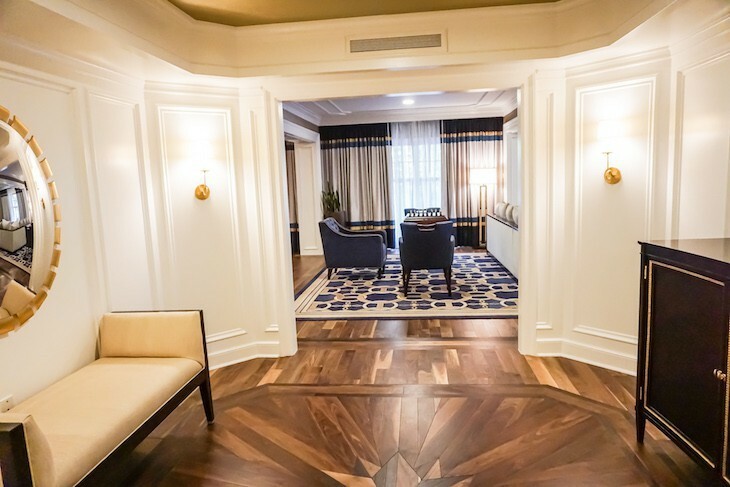 There's also two Non-Turreted Two-Bedroom Suites with similar decor, one of Floor 3 and the other Floor 4, each with 1,256 square feet. 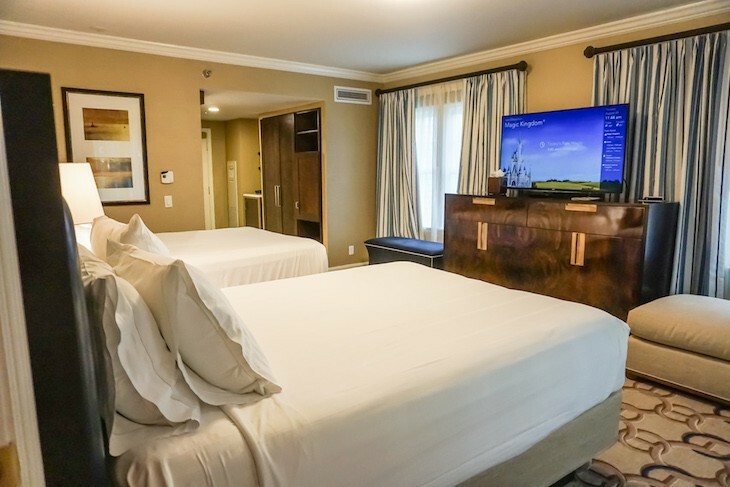 The two guest rooms come with a king bed and there is a sofa sleeper in the living area. 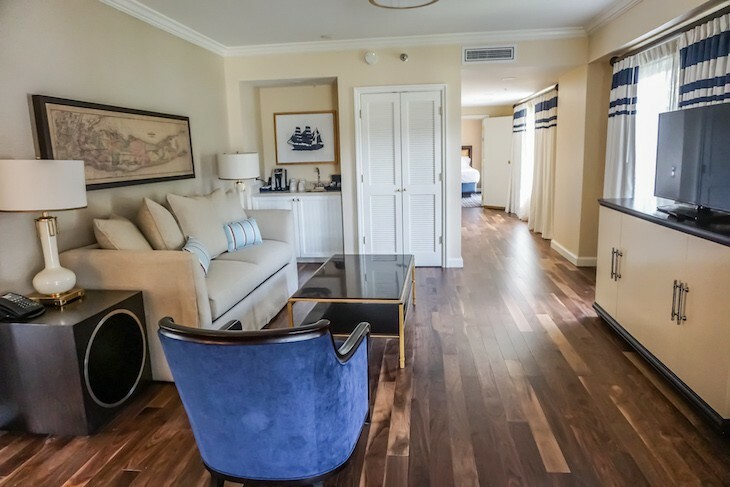 Almost identical at 2,017 square feet but with different décor are the two-bedroom, two-and-a-half-bath Presidential (4th floor) and Admiral (5th floor) Suites. 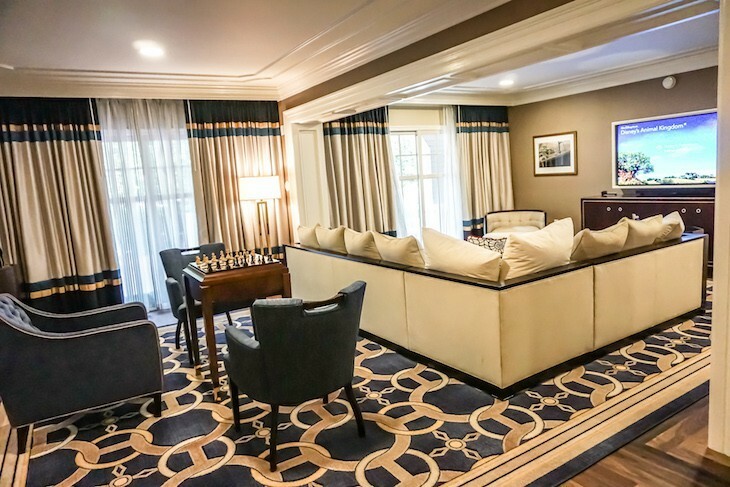 The Admiral Suite overlooks the BoardWalk and Crescent Lake and is decorated in shades of navy, cream, and gold. There’s a hardwood foyer with half bath as well as two living areas, both with hardwood flooring and nautical-style area rugs—one turreted with hardwood flooring and porthole-style windows overlooking Crescent Lake with sofa, four easy chairs, and round coffee table; the other with a sectional sofa loaded down with soft pillows, two easy chairs, coffee table, credenza and oversized TV, desk, and gas fireplace. 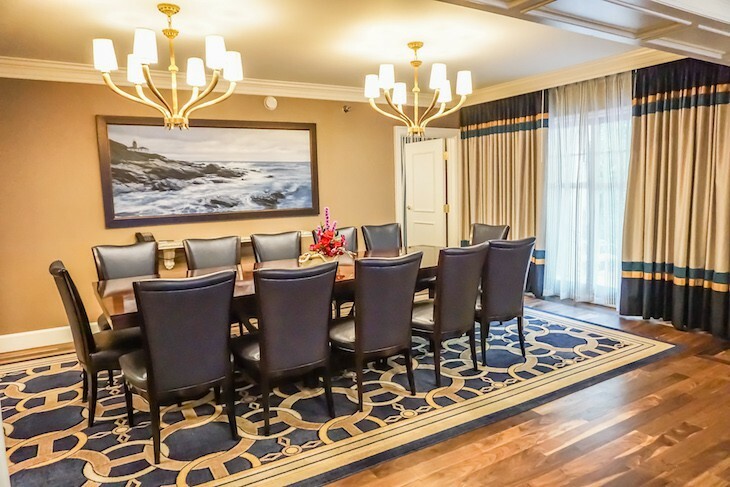 A separate eight-person dining room adjoins a small wet bar/service kitchen with a service entrance. The master bedroom offers a king bed with light bronze leather headboard, easy chair, bureau, and TV. 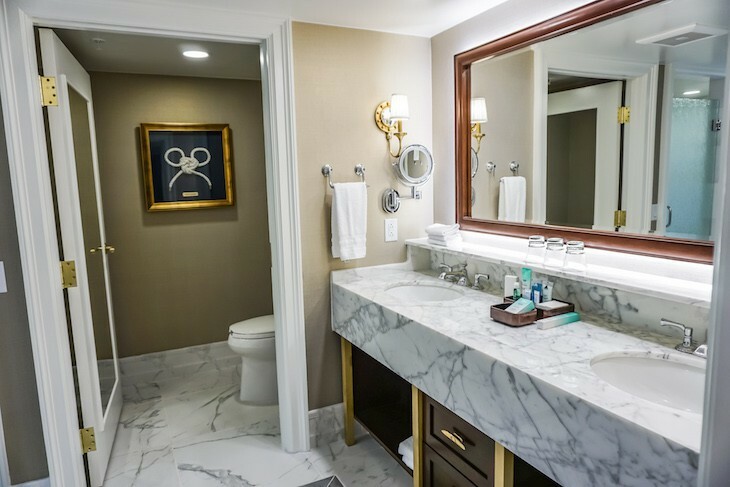 The white/gray marble master bath is an accessible one with roll-in shower, two sinks, deep soaking tub, and an open toilet area in an alcove. 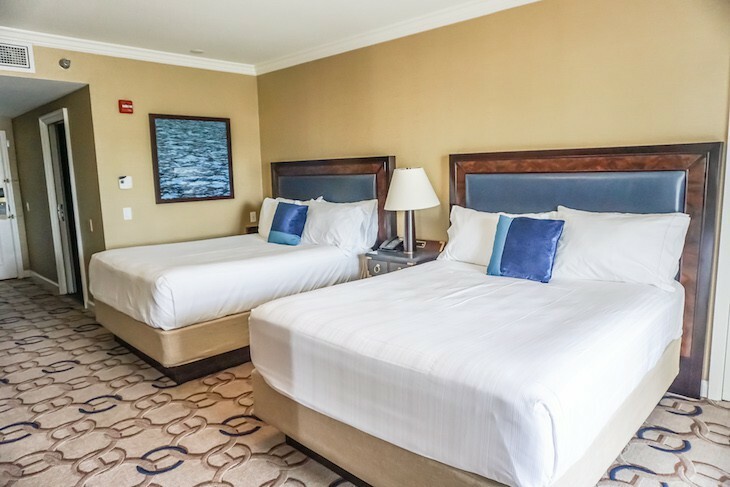 A second bedroom with two queen beds is a standard size room with upgraded decor with it’s own additional entrance. Balconies are found in each bedroom and off the living area with a stand-up, one-person balcony off the dining area. 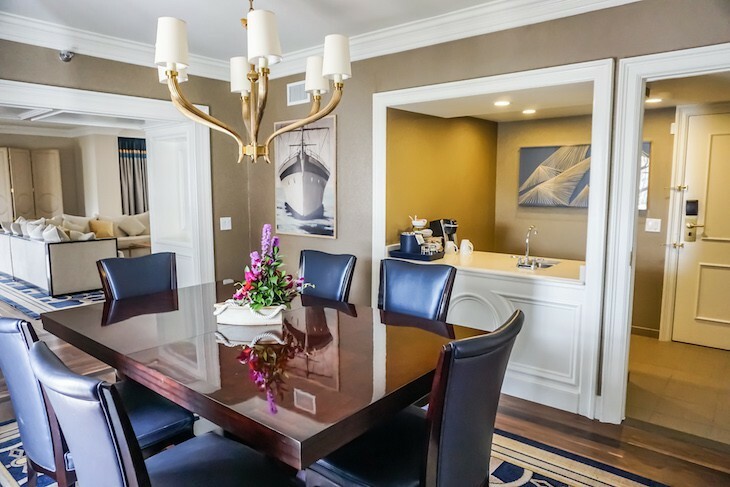 The resort’s largest suite at 2,374 square feet is the first floor, two-bedroom, two-and-a-half-bath Captain’s Deck Suite. A hospitality suite of sorts, it’s tucked away in a corner area at the front of the resort perfect for privacy, just past The Marketplace retail store. 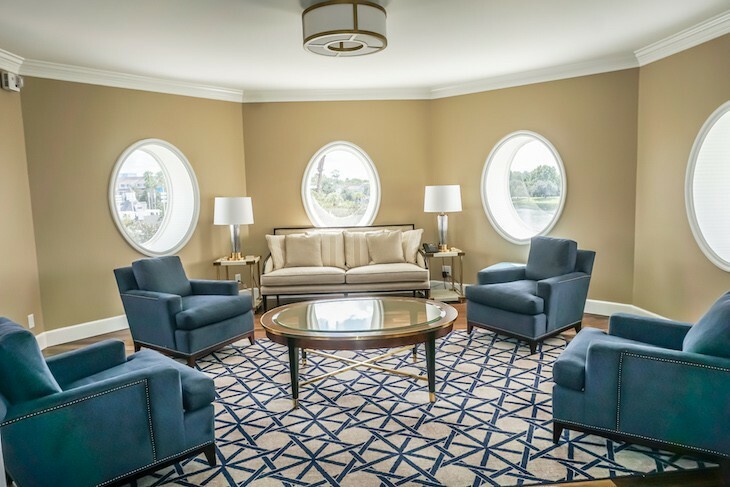 A hardwood octagonal foyer leads to a contemporary, nautically decorated suite decked out in a cream, navy blue, and gold palette. The sizable great room features hardwood flooring topped with a cushy area rug, a large sectional sofa filled with throw pillows, half-circle modern easy chair in the corner, square coffee table, chess table, credenza above which hangs an oversized TV, and a dining room with seating for twelve; a desk, bar, and half bath sit in a wide hallway near the master bedroom. Off the dining room is a full kitchen (minus a stove) with a full-size refrigerator, sink, Keurig coffee make, microwave. 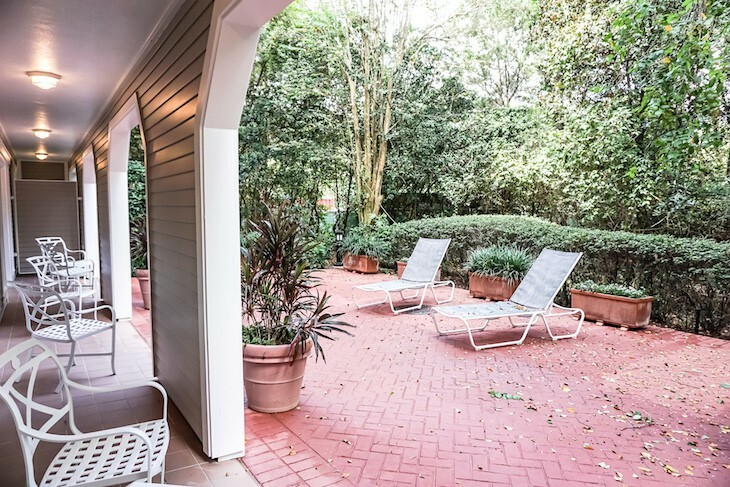 Doors lead out of the living area to one of the suite’s best features, an oversized brick garden patio (shrubbery blocks the view of the adjoining parking area). Room 1111 actually connects to the Captain’s Deck suite to make a 3-bedroom. 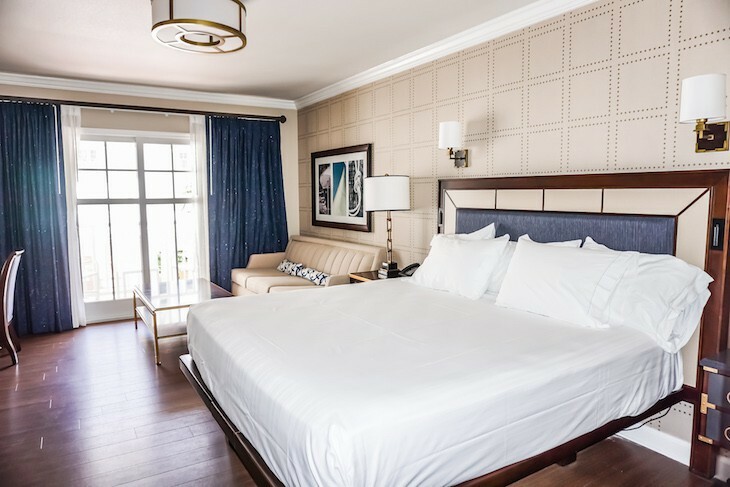 Each of the Captain's Deck bedrooms has its own private patio, with the master bedroom offering a king-size bed, chaise lounge, bureau, easy chair and ottoman. 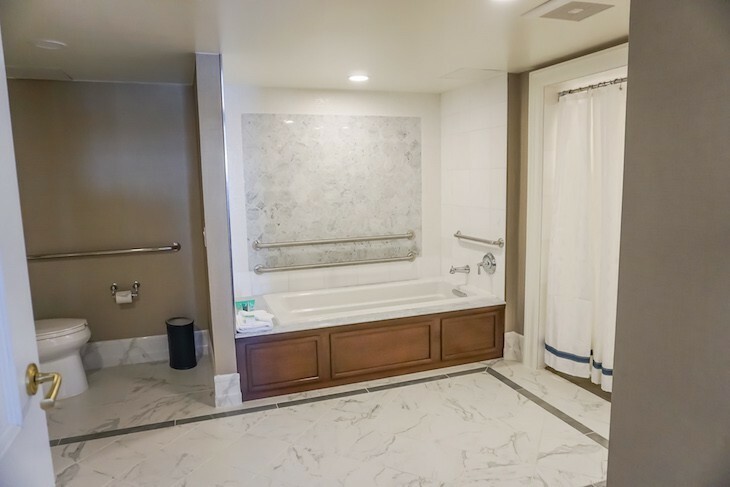 Walk through a hallway with a walk-in closet and vanity area to the lovely white and gray marble bathroom with its oversized shower, deep soaking tub, double sinks, and separate commode area. 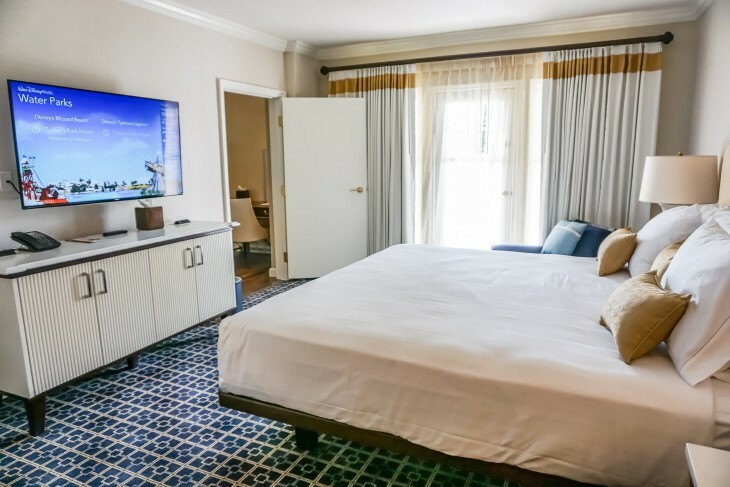 The suite’s second bedroom with two queen beds is similar to a regular guest room with slightly upgraded décor, chaise lounge, large bureau, and second full bath. 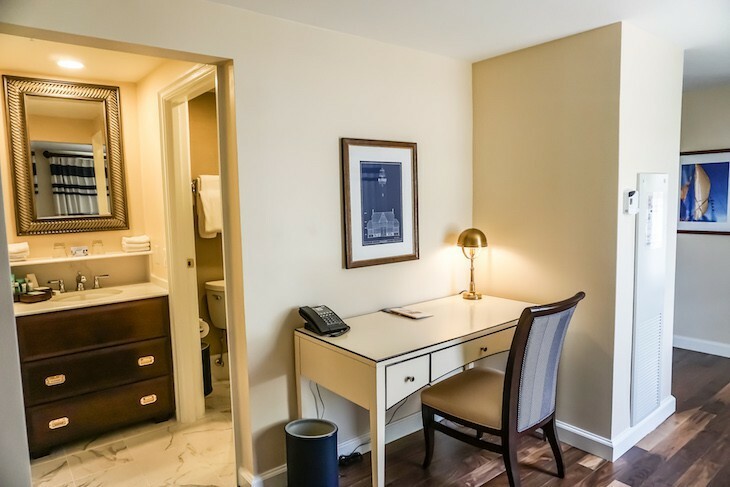 There are several entrances to the suite: the main entrance foyer area; the office/desk/bar/half bath area near the master bedroom; service entrance off the kitchen; and the guest bedroom.